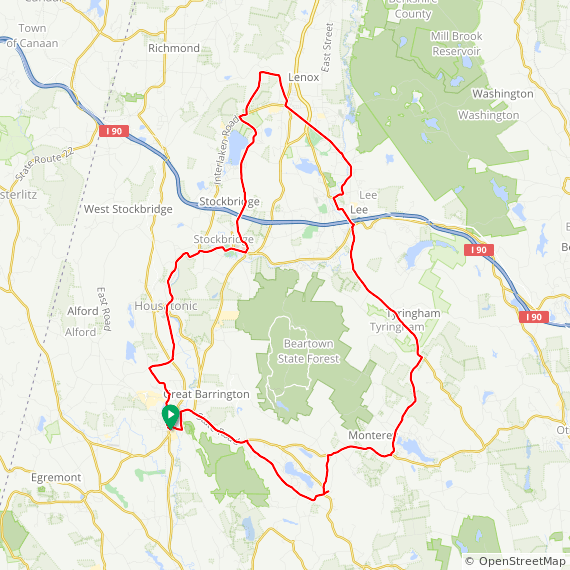 This scenic ride with 35-50 mile options starts from downtown Great Barrington Massachusetts and heads out of town up “Three Mile Hill. We circle around Lake Buel, then top to check out the Berkshire Fish Hatchery in Hartsville. Continue on to Monterey, MA, and stop for refreshments at the Monterey General Store. The full continues past Lake Garfield with a sweeping descent into the Tyringham Valley. Make sure to stop to view the Gingerbread House in Tyringham just before taking a left to South Lee. For a longer ride, continue from Tyringham to Lee and Lenoxdale to Lenox, where Undermountain Road is a scenic alternative route to the Tanglewood grounds. From there, take Hawthorne Road and Prospect St. past Stockbridge Bowl, with a nice descent past incredible Stockbridge mansions to rejoin the shorter route.